I woke up on the stupid side of the bed yesterday, the one where you get mad for no reason at the smallest stuff. The customer at work who asked for no foam on their latte (without saying please, wtf, lady), the fact that the metro was so crowded, the old woman moving at a glacial pace who got stuck behind on the walk home, were all things that normally wouldn't phase me, but yesterday, they did. I know that when it gets to I point where I'm annoyed at old ladies for being old ladies, that I need to do two things: check myself, take a minute or two to collect why I'm freaking out over nothing-- and also, cook. Cooking makes me feel better about all the things, all the time. The sense of accomplishment, reward, and harmony in the kitchen is nearly perpetual. I concluded a few things: I'm in the middle of post-stress stress- I handed in a paper worth 25% of my mark yesterday, and while I'm happy to have it out of my hands, I got all worked up writing it and now I'm left gun shy over waiting for the mark. I'm sick of winter-- Montréal got buried underneath about a foot of snow this week, on the first day of Spring, just when I thought we were turning a corner. I'm also homesick. I'm heading home next week for the Easter long weekend, and the fact that I know I'm GOING at all is making me chomp at the bit to get there, to see my family and friends. And all of these things brought me to... crepes. Crepes always remind me of my Babcia, because the only time I ate them as a kid was when we went to visit her in Tinyboringtown, Ontario. Warm homey feelings of nostalgia, plus pride in using her recipe just snugs me right in the 'feelgoods.' 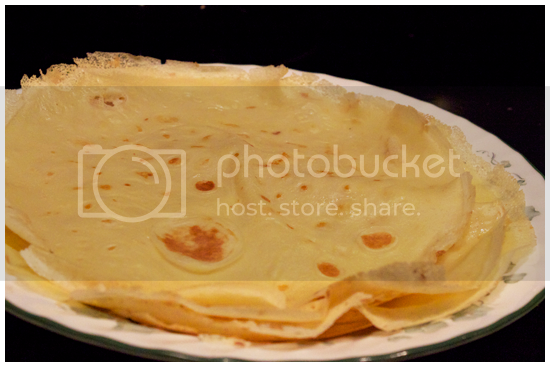 From my Russian grandmother, to my mother to me, to you, friends: these crepes are great because you can eat them sweet or savoury, and they're simple. Anything that's simply good in my books is GREAT. 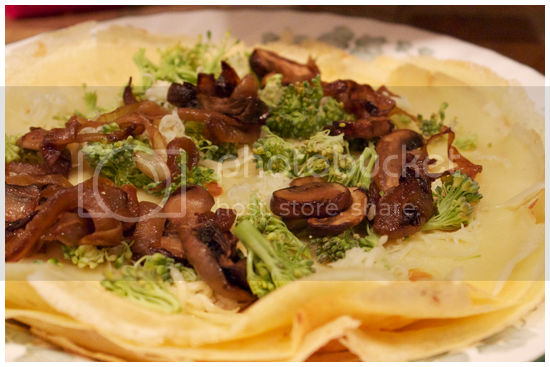 I dressed mine up for dinner with caramelized onions, sauteed mushrooms, broccoli florets and cheddar cheese. DELICIOUS. You'll see. A few things to note: this recipe is an exercise in patience and practice, if at first you don't succeed, try, try again and eat the mistakes because damnit, they will be delicious anyway. Two things are key: butter and timing. I tried to make these awhile back, and I greased the pan with olive oil which didn't work so well. 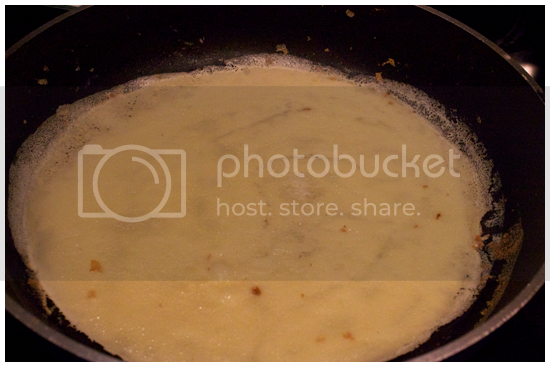 A well buttered pan is your weapon of choice here. Also, I know crepes are thin, tiny pancakes so you think they need nanoseconds to cook, but DON'T flip them until the edges are browning! 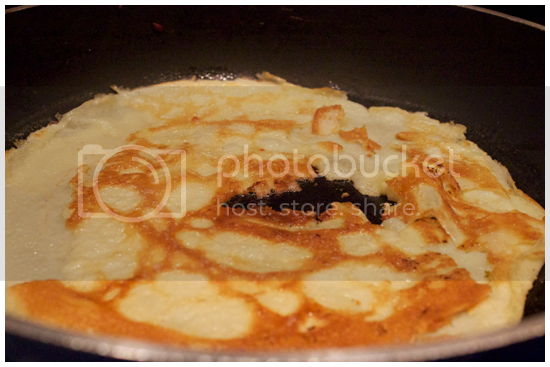 Just like real pancakes or teenagers, they will come away from the pan easily when they're ready to be flipped. Don't pressure them! 1. 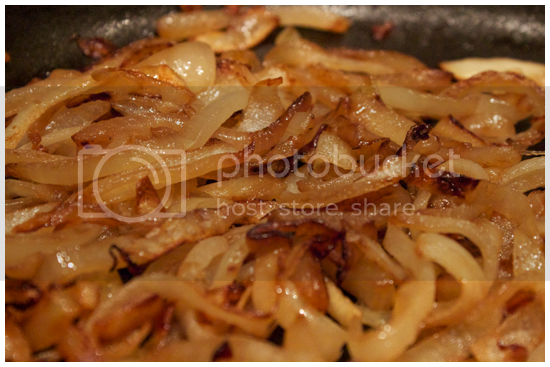 Melt butter in a large frying pan, then add the chopped onions. 2. Cook them on medium-low heat. Stir them once in awhile but let them do their own thing, for 30-45 minutes until they're a dark, caramel brown. 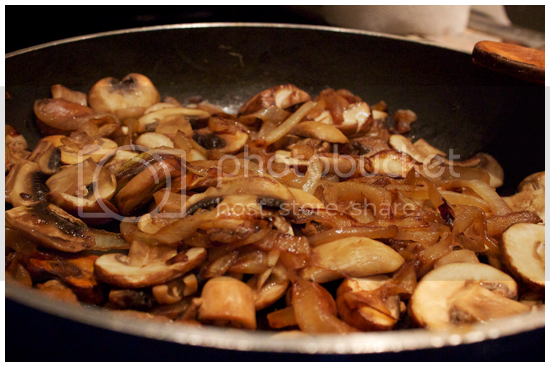 (I added in the sliced mushrooms just before the onions were done and sauteed them all in the same pan, because multiple dishes are for suckers.) 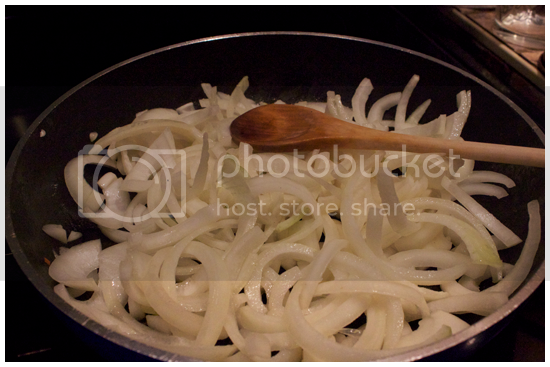 Salt the onions to your taste! Makes about large 6-8 crepes. 2. Butter a large frying pan and keep it over medium-low heat. I found the best way to pour the batter into the hot pan was to make a circle around the edge of the pan with the batter, then to tilt it until it spread to cover the entire bottom. 3. 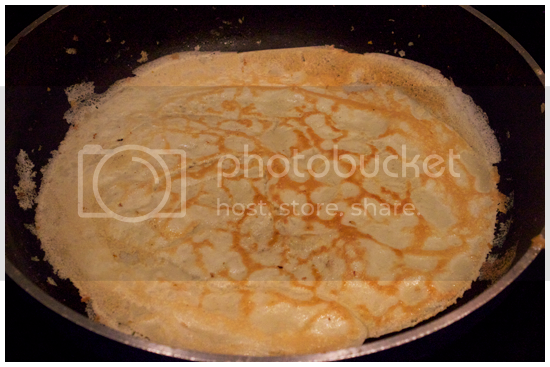 When the top of the crepe is no longer shiny and the edges are brown, slide a spatula beneath it, gently easing it away from the pan. Flip that motha', and the other side will cook for about 30 seconds.. 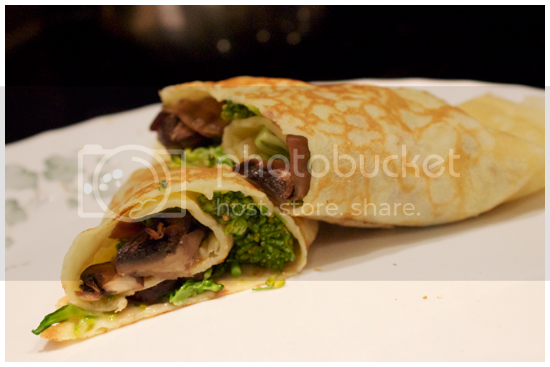 This takes some practice, as you can see from the picture below this caption, sometimes crap happens when you're cooking crepe, and it will create a frustrated sensation in your cranium, but trust, you can do it! I did, and I did a happy dance when I finally achieved my dream of carby perfection. I am being literal about that dancing thing, too. 4. 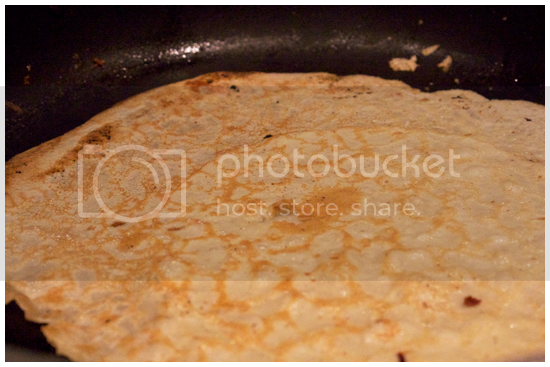 Now you have a tasty pile of crepes to do whatever you please with. As I said, these would be great with maple syrup, or slathered with Nutella and crammed full of raspberries, but, as this post will demonstrate, this is a dinnertime food, too. ...Rolled it up, and put it back in the frying pan to melt the cheese. Then I ate it so fast, I barely had time to snap pictures of it, let alone garnish the plate, let alone ANYTHING.